Tiny plugin interface to extend the Galaxy client. 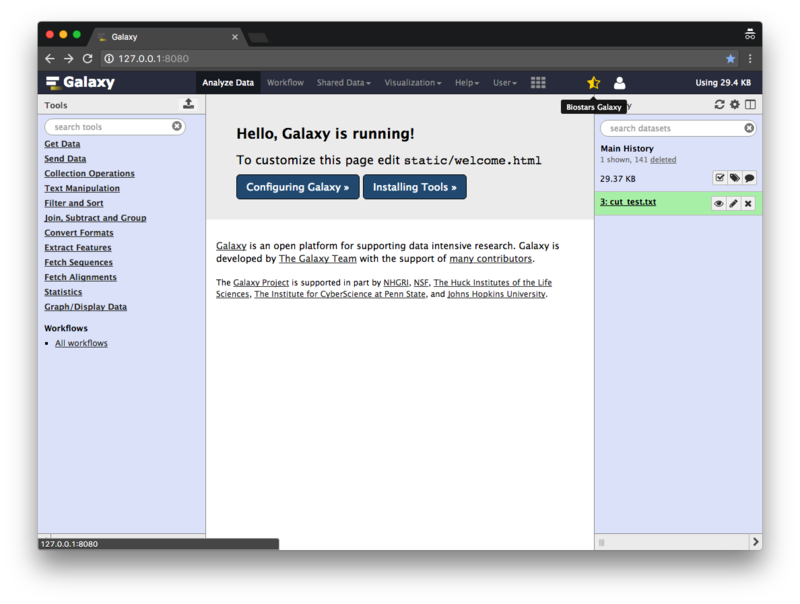 Galaxy webhooks provides a simple way of inserting icons, links, or other HTML elements into predefined locations. For this Galaxy provides some entry points which can be used to extend the client with content. This content can consists out of simple HTML, JS or dynamically generated content from a python function. Please note that the webhooks interface is new and can change in the coming releases. Consider it as beta as we don’t make promises to keep the API stable at the moment. 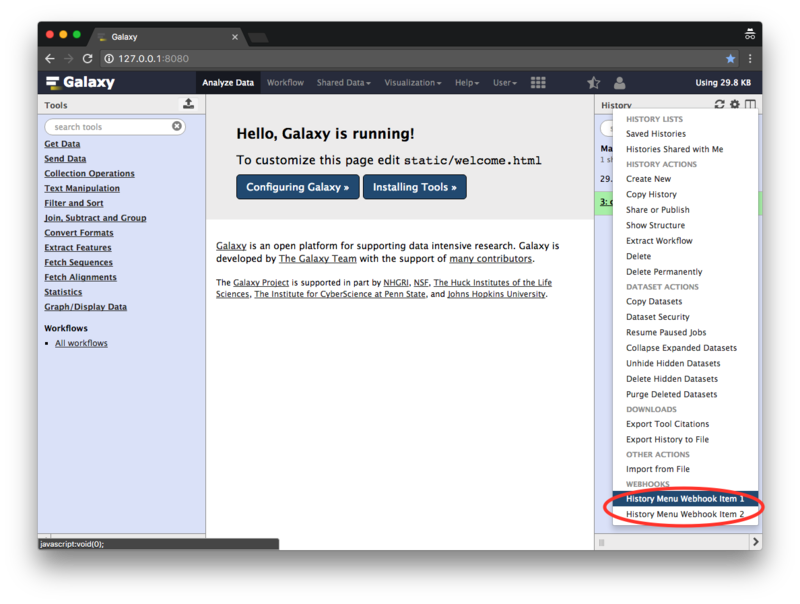 All webhooks that are included in the main Galaxy distribution are located in the config/plugins/webhooks/demo folder and are deactivated by default. 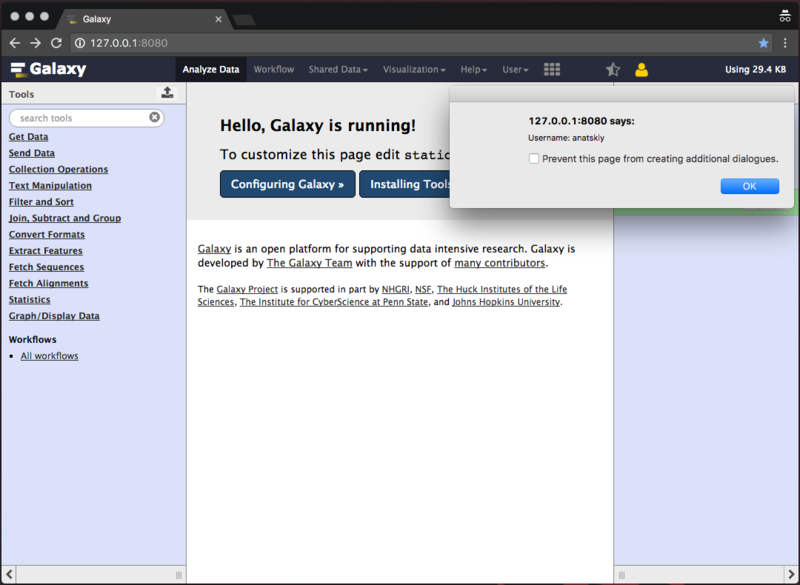 To activate these demo webhooks make sure this path is added to webhooks_dir in your galaxy.yml. You can add as many webhook folders as you like as a comma separated list. Webhooks supports one additional layer of activating/deactivating by changing the activate: true in each config of each webhook. 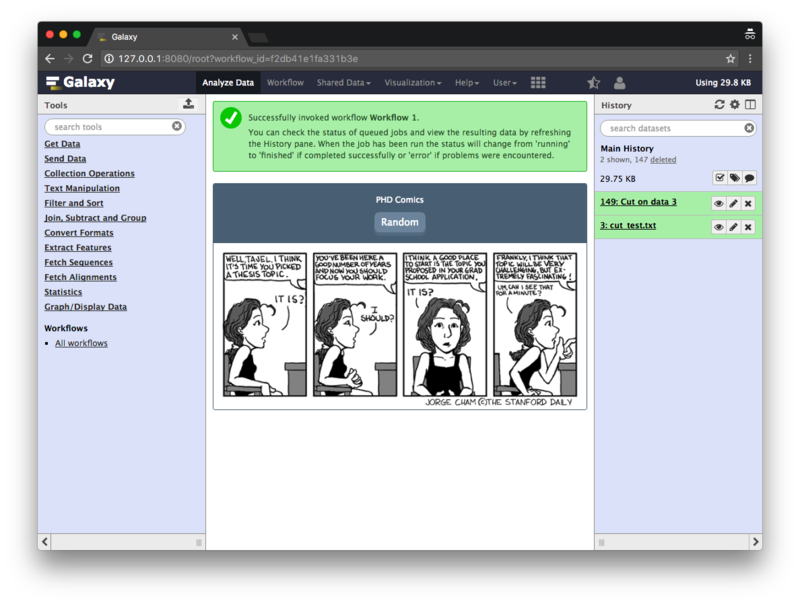 Tool and workflow: A comic strip can be shown when a tool or a workflow is running. Right now PhD and XKCD comics are provided. A button that shows a pop-up with information about an user. The history menu can be extended. In this case we use two dummy entries ‘History Menu Webhook Item 1’ and ‘History Menu Webhook Item 2’. All other options can be anything used by the plugin and accessed later via webhook.config[‘…’]. Some plugins might have additional dependencies that needs to be installed into the Galaxy environment. 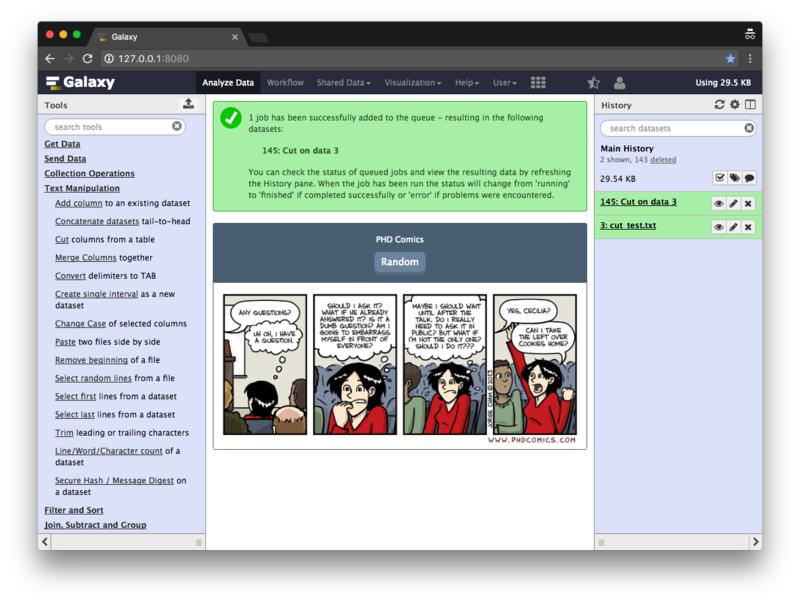 For example the PhD-Comic plugin requires the library beautifulsoup4. If these dependencies are not present plugins should deactivate themself and issue an error into the Galaxy log. If a tool or a workflow plugin has script.js and/or styles.css, the content of these files will be read as two strings and sent to the client and appended to DOM’s <head>. Such approach is a possible bottleneck if the two files are big (however, this shouldn’t ever happen because plugins are supposed to be small and simple).